Insufficient appellate capacity was not new to Virginia’s judicial system in 1983, when the General Assembly passed legislation creating the Court of Appeals of Virginia. As early as 1848, the Supreme Court of Appeals faced a backlog of eight to nine years. To assist the court, the legislature created a special court of appeals. The General Assembly constituted this court three more times–in 1872, 1924 and 1928–before constitutional revisions of 1971 removed this prerogative. The same year, a Court Study Commission chaired by Chief Justice Lawrence I’Anson identified insufficient appellate capacity as the chief problem facing the judicial system in Virginia and recommended creation of a permanent intermediate appellate court. Few people questioned the need for more appellate review; at the time, Virginia was the most populous state without an intermediate appellate court and only a fraction of circuit court decisions were reviewed. There was fierce debate, however, over the proposed court’s jurisdiction and right of appeal. The Supreme Court of Virginia wanted petitions for appeal, and most lawyers wanted an automatic right of appeal. Prosecutors argued the new court would do nothing to reduce the workload facing the Supreme Court of Appeals. A compromise was reached in 1984 providing for establishment of the Court of Appeals with ten judges instead of the twelve initially proposed, fewer automatic rights of appeal, and limited jurisdiction. (The court was expanded from ten to eleven seats by statute in 2000.) The court was given appellate jurisdiction as a matter of right over circuit court decisions in criminal cases (except death penalty cases) and domestic cases and for appeals from administrative agencies and the Industrial Commission. Most of the appellate jurisdiction in civil cases remained with the Supreme Court of Virginia. Court of Appeals Group Oral History Interview, recorded at WCVE studios on March 27, 2013. Left to right: Hon. Norman K. Moon, Hon. Sam W. Coleman, III, Hon. Barbara Milano Keenan, Hon. James W. Benton, Hon. Lawrence L. Koontz, Jr., and Dr. Cassandra Newby-Alexander, Professor of History, Norfolk State University. Listen to an audio recording of the discussion or read the transcript. The court decided early on to interpret the statute creating the court to require that every litigant before the court receive a written opinion explaining the reasoning behind the court’s decision. “I mean no matter whether it was a criminal case, you had a right to get a written opinion, and we turned out a lot of written opinions,” U.S. District Court Judge (Ret.) Norman K. Moon recalled. The judges also agreed to hold session four locations across the state, with judges rotating their service to the different locations. “We wanted to try to be user-friendly,” Judge (Ret.) Sam Coleman remembered, especially given the delay in disposition of cases before the Supreme Court of Virginia at the time. The Court of Appeals proved to be hardworking and efficient. In its first year of operation, the court received 1,641 filings and granted more than 200 appeals, and the number of cases filed with the Supreme Court of Virginia decreased from 1,900 to 1000. As some opponents of the new court predicted, the high court’s backlog continued to grow. Increased staff and improvements in administrative efficiencies reduced backlogs in both appellate courts by 2005. Between 2005 and 2012, filings decreased significantly in both courts. Since it was constituted in 1985, 39 judges have served on the Court of Appeals of Virginia. 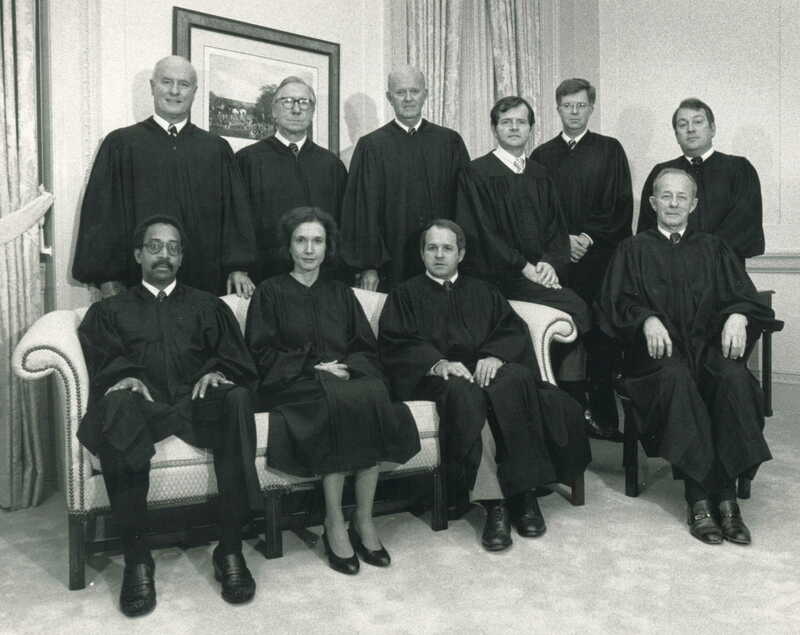 Eight were subsequently elected to serve on the Supreme Court of Virginia, including Chief Justice Donald Lemons; and three were subsequently elected to federal judgeships. Chief Judge Glen A. Huff, who began his term as chief on January 1, 2015, is the sixth person to serve in the position. 1981 State of the Judiciary Report, 3-4; legislation establishing the Court of Appeals, HB 235, ch. 413, p. 518, 1983 Acts of Assembly; legislation amending the structure and rules of practice for the the Court of Appeals, SB 255, ch. 703, p. 1521; SB 253, ch. 701, p. 1521; HB 180, ch. 635, p. 1107; and HB 2, ch. 632, p. 1105, 1984 Acts of Assembly; see also 1983 State of the Judiciary Report, 15-18; Report of the Joint Subcommittee Studying the Commonwealth’s System of Appellate Review in Civil Cases, 1991, H. Doc. No. 4, retrieved from LIS (Virginia Legislative Information Service), on March 18, 2015; Report of the Judicial Council of Virginia Supreme Court of Virginia Statistical Review, HJR 111, 2012 (December 7, 2014), retrieved from LIS on March 18, 2015; Court of Appeals Oral History Group Interview, March 27, 2013, WCVE Studios, Richmond, Supreme Court of Virginia Archives, Virginia State Law Library; Patricia Davis, “Virginia Appeals Court is Mystery to Some: Low-Profile Panel Heard Hundreds of Cases in First Year,” The Washington Post (1974-Current file): January 27, 1986, ProQuest Historical Newspapers: The Washington Post (1877-1995), D1; Alan Cooper, “Virginia Supreme Court Works Harder to Cut Backlog of Cases,” The Richmond News Leader, December 28, 1988, 18, vertical file, Virginia State Law Library, Richmond; Rob Walker, “Court of Appeals Ends its 1st Year,” Richmond Times Dispatch, December 22, 1985, retrieved from America’s Newspapers in 2005; Baker McClanahan, “Appeals Court Getting More Cases, Handling Them Faster,” Virginia Lawyers Weekly, April 21, 1997, retrieved from valawyersweekly.com in 2012; and Brent Baldwin, “Virginia Court of Appeals is Celebrating 20 Years,” Virginia Lawyers Weekly, March 28, 2005, retrieved from valawyersweekly.com in 2012.